George Gillette, Council chairman of the Three Affiliated Tribes -- Hidatsa (called Gros Ventre by whites), Arikara, Mandan -- of Fort Berthold Reservation in North Dakota, weeps as the US Secretary of the Interior signs the 1948 papers confirming the forced sale of 155,000 acres of the North Dakota reservation to flood them by the Garrison Dam and Reservoir. Gillette said "The members of the tribal council sign this contract with heavy hearts. Right now, the future does not look so good to us. Our Treaty of Fort Laramie made in 1851, our tribal constitution, are being torn to shreds." And the land -- all the good, liveable, farmable land of the reservation -- was to be drowned. Gillete's photo is inset into an aerial photo taken July 7, 1954. The dam has been closed, the waters are rising to fill the entire valley and its tributaries. In the right foreground, brown earth indicates where archaeologists made a hasty partial excavation to study Like-a-Fishook-Village. Of far greater importance to tribespeople, the waters of what is now Lake Sakakawea flooded the entire sheltered, fertile bottomland and river benches, the villages, roads, schools, hospitals and communities where the Hidatsa (pejoratively called Gros Ventre), Mandan and Arikara peoples had built and farmed. They were forced to move to the shelterless, windswept, barren prairies, and the arms of the lake now cut off the new communities from each other on the unfriendly expanse of what's left of their destroyed land, where they had lived and farmed from time immemorial. Fine-quality Knife River flint tools have been found thousands of miles away in sites 7-9,000 years old, distributed by ancient trading networks. Along the upper Missouri, and its tributaries, the Little Missouri, the Knife, and the Heart rivers lived the people who farmed the river valleys, hunted the windy plains, and made great earth-covered lodges surrounding a sacred dancing plaza at the center, in the valleys. 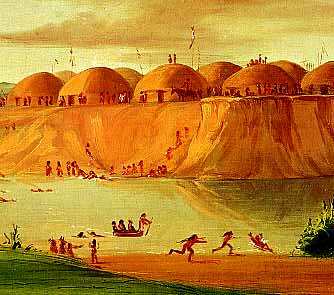 George Caitlin painted this Hidatsa village in 1832. In 1837, the smallpox plague struck. Almost half the Hidatsa, and 7/8ths of the related Mandan tribe died. The survivors moved from their stricken villages and combined in one common village, Like-a-Fishook, where tribal identities and clans remained separate but the people shared land, work, hunting., and farming the fertile river bottom lands and benches as whites began to move in at a fort and trading post nearby. Later, Like-a-Fishook was abandoned, as the people spread out across the rover bottomlands into small farming communities. Roads, a ferry and a bridge kept the settlements in touch socially. There were schools and hospitals. The valley farmland had rich woil and was sheltered from the fierce winters and dry, harsh summers of the waterless plains, above. This housing section is a counterstatement to the widespred non-Indian teaching of our history and culture by playing dress-up Indian in fake costumes, and building trashcraft toy models of traditional housing. Earth lodge housing is entirely wiped out, drowned, not in use anywhere for any purpose. To model the phenomenon of the drowning of Indian lands and settlements, students should make a tabletop toy village, then turn a hose on it. Of course nobody would really be sad about this, it's just a toy village, not your homes of hundreds or thousands of years. Just a little mess to clean off the classroom floor. Useless trashcraft, then a hasty cleanup, not the tragedy all these dams have been to so many Indian peoples. For Native people this drowning of our lands is not an ancient but a modern loss. Kinzua Dam, drowning the entire New York Seneca Allegany Reservation, and the sacred Cold spring Longhouse. New Mexico: Cochiti Pueblo, like a star being put out as one observer described it. Parker Dam in Arizona, drowning all the arable, inhabitable land and leaving the Chemehuevi reservation uninhabitable desert. American Falls Dam, Boysen Dam (Shoshone-Arapaho) , Yellowtail Dam (Crow) , Kerr Dam (Salish-Kutenai), the many dams of the Columbia River drainage, including the biggest, one, Grand Coulee. (Colville, Spokan). Tellico Dam flooded ancient Cherokee historical and sacred sites, but (aside from the Cherokees whose opposition was unnoticed), the only opposition was by those who wanted to save a small fish called the snail darter. In Canada, the dams of the James Bay I and II project, flooding Cree lands; Churchill Dam; Garrison Dam (in the US). These are all recent destructions-by-drowning of Indian lands -- most of them after World War II, a few shortly before it. The Garrison dam that destroyed the Hidatsa, Mandan, and Arikara lands, settlements, bridges, roads, hospitals, and way of life was conceived in 90 days in the 1940's. It was opposed as a meaningless boondoggle project by some of the water control federal planners, and the BIA testified the site was selected becaue "a large portion of the inundated area would be comprised of Indian lands." The only really habitable land was the river valley. That's all underwater now. "Today I can only go to Independence Point, look over the thousands of acres of water and try to imagine what it was like," said Gerard Baker. "My thoughts are usually interrupted by speedboats, pleasure boats and fishermen who are usually non-Indians enjoying the lake, not knowing or caring about the history that lies underneath the waters." Edward Goodbird, following instructions of his uncle Wolf Chief, drew in 1914 the construction of a winter house, a they had been made before the plague and depopulation caused the people to settle without moving in Like-a-Fishook Village. In winters, people left the large earth lodges built in circles centering on the ceremonial plaza, and formed small winter communities in sheltered wooded valleys., where firewood was easier to get. Similar earth lodges -- but much smaller -- were built by women for their winter villages. Goodbird shows a twin lodge structure, with the smaller structures for women and children easier to keep warm. The two lodges were united by a covered walkway. Construction of both the smaller winter and large summer lodges was done in the same way. Buffalo Bird woman in 1906-14 described building the smaller winter homes in the late fall. Large trees were felled to make the frameworks. "Axes were ringing in all directions. Here and there two women would be cutting trees near each other and a tree would threaten to fall on one of them. The cutter could be heard crying 'Look out!' Everybody was busy." Four 12' tall forked trees pounded into the ground with crossbeams formed the central square framework which hold up the slanting logs of the roof. Theyare shown at 1 on Buffalo Bird Woman's floor plan of her father's lodge. They were considered to be alive. They were prayed to and decorated with cloth offerings. 2 The fire area for cooking and living in the center of the lodge. 3 A bed for the most honored man whom the lodge belonged to, was inside this area, closest to the fire. 4 Atuka -- the place of honor inside the central area, facing the door. 5 Wid�-daktsuti -- inside the door was built a partiton of upright narrow wooden posts. This kept wind from rushing in the doorway, and also barred small boys and dogs, who were not allowed inside the partitioned area. 6 Atuti -- All around the perimeter of the lodge were 12 pillars that supported the rafters which radiated down from the smokehole at the center and the 4 central posts. Across the tops of these posts ran stringers, and slanting down to the ground was an outer wall of vertical-slanted logs. This formed a storage space where firewood was kept, and a corall for favored horses, who might be brought in to protrect them from enemy raiding or dangerous storms. The log walls and roof were covered with willow poles, then brush, then heaped with dirt. 7 Food storage platform, raised like a table was used for preparing and serving, as well as keeping food in immediate use off the ground. 8 Beds -- bed compartments were all around the outer wall, partly inside the low slanting space made by the outer log wall. 9 Sacred bundles owned by various persons from the lodge, and the Waterbuster Clan's ancient Midipadi bundle form a shrine in the lodge. The shrine-keeper's bed is next to the shrine. 10 Cache pit dug into the floor with dried fruits and vegetables in storage. Three more pits were outside. Caches were opened every 4 days to removeenough food, then resealed. See a computer-generated Structural model of a Hidatsa-Mandan earthworks house by solar architect Dennis Holloway. Karl Bodmer painted the inside of the lodge from the back of the lodge, looking over to the fire area. Light comes from the smokehole above. During rainstorms, the hole is covered by one of the round buffalo-bull boats. The horse corral, at right, is only sketched. Some partly-cured hides are hung for smoke-drying. Winter lodges were smaller. "The winter lodge was a somewhat rough affair," Wolf chief said. "We built somewhat rough because we would very likely not come to the same place the following winter. Some men who had the character for being good workers helped their wives cut logs for the lodge. Others who were less energetic left the work entirely to their wives. Women's work had an important economic role in the community. By Hidatsa custom, wsomen owned the fruits of their labors. Women who farmed, dressed skins, built houses, sewed clothing made themselves and their families rich. Men cusxtomarily did none of those things, and needed industrious women to become prosperous. A woman who was a good worker was seen by men as a source of wealth and prestige. For women, work was the road to respect. The Garrison Dam flooded all parts of the reservation where 99% of the people lived. (The pink area is a part of the reservation taken in 1910.) This fertile, sheltered land was heavily used for agriculture and grazing, by the 1940's, and all the reservation villages were located there. The land not flooded was the high, arid plains land. Its potential for agriculture was unknown. Members of the Three Tribes saw it as "treeless, farmless, waterless foreign land" according to hearings testimony. "We had no choice, I guess, just like a gopher, you know, when they pour water in your house you better get out or drown." -- Cora Baker, 1984. "The land flooding changed the reservation. Where creeks gad been huge arms of the lake now formed, dividing the land into 5 isolated segments. Houses were scattered even more widely than by [Dawes] allottment. School districts were reshuffled. The timber resources were all gone, as were many of the natural coal outcroppings where the people had mined fuel for themselves. The upland proved not only poor for agriculture but difficult for rancing as well." "Where we got along real well with about one-half ton of riverbottom hay [per cow, for winter] we found we now needed two tons of upland hay as well as a manmade shelter to winter each cow. The horses, which fended for themsleves in the bottomlands, now required feed and shelter also. Our fuel supply of coal and wood no longer existed, so we were compelled to resort to fuel oil and propane for heating and cooking, and this all meant new dollar costs that had to come out of ranch production." (Testimony at 1986 hearings) The dam produced a lot of electricity -- but energy costs for the Three Tribes soared. " Dani Sue Deane testifiied at the hearings: "I would like to address the things that cannot be measured statistically by the taking. A self-sufficient supporting society changed radically. The economic heartland was taken away, leaving deeper poverty, social dysfunction, further complicated by separating the communities. This separation caused a breakdown of families, clan culture, tribal government, and left many feeling totally defeated. " "It seems that when we Indians progress to a point where we can be self-sustaining, they move us again," Adam Mandan testified. "The non-Indians seem to think we are lazy and don't want to work, but it comes right back to the fact that when we do learn to cope with a different style of living into which we are forced, they change it again. . . . The needs of the tribe are great but our tribal people can make it even up here on the harsh hilltops, given a fair chance. Our homeland can never be replaced and what we lost can never be regained, but we want to make a new start. We did it before and we can do it again." With the Ft. Laramie Treaty of 1851, the Hidatsa were guaranteed 12.6 million acres for a reservation, covering most of their original settled territory from the Heart and Knife Rivers to the Yellowstone River. In 1870, the Fort Berthold reservation was formally established, with much smaller boundaries, encompassing about 7.8 million acres. Neither Congress nor the Hidatsa ever agreed to this reduction. In 18890, the Northern Pacific Railroad wanted to put a rail line through the southern part of the reservatiuon., and to finance this, were given all the southern half of the Hidatsa reservation to sell to incoming whtie settlers. Neither Congress nor the Hidatsa agreed to this reduction, to 1.2 million acres. In 1891, the Dawes Allottment Act went into effect. Like-a-Fishhook-Village was broken up. Families received 160 acre allottments and were scattered around the greatly diminished area, but tended to form small settlements along clan-community lines. Two thirds of the resremaining resefvation was sold off as surplus. In 1910, the nbnortheastern corner land (pink on the map) was taken and sold to white settlers, over the opposition of the Three Tribes. 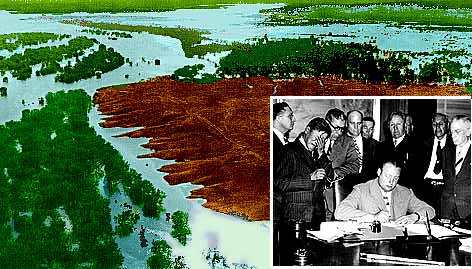 In 1954, the about 170,000 acres of the remaining land -- all of the fertile, sheltered bottomlands, the place where all Indian communities existed and had their farms and woodlands -- was flooded by the Garrison Dam. Find out more about the Three Affiliated Tribes today-- such as their electricity-producing windmill farm project, here. The review of The Road to Independence book review also has links to reviews of books by and about other Hidatsa traditional people, including Edward Goodbird's sketches, some of which have been made into a coloring book by the Minnesota Historical Society. To study archaic native housing, usually by making trashcraft tabletop toy villages, ignoring the environment, the land and the people who lived there, and the history of what was done to land and people, as is done in most U.S. non-Indians schools for a dribble of "minority culture," is irresponsibly racist. CREDITS: Gillette photo by Associated Press, from The Native Americans, Turner Publishing, 1993. Aerial photograph of the Garrison Dam flooding of the Missouri Valley, Alan R. Woolworth, black and white in The Way to Independence exhibition catalog and book about the Hidatsa people by Minnesota Historical Society, St. Paul, 1987. I colored the photos. Caitlin painting of Hidatsa Village is in the National Museum of Art, Smithsonian Institution, scanned from The Road to Independence. 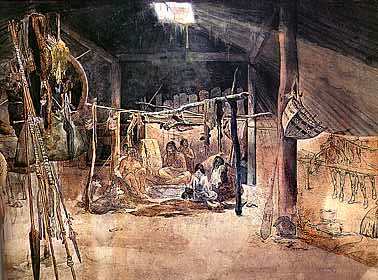 Karl Bodmer painting, Interior of a Mandan Lodge, 1834, Joslyn Art Museum, from The Native Americans, Turner, 1993. Drawings by Hidatsa EdwardGoodbird (Buffalo Bird Woman's son) are part of an immense collection of writings, photos, paintings, drawings that Mandan people that these people shared with Gilbert L. Wilson, a Minnesota anthro, from 1906-1918. The huge collection, mostly ignored by professional anthros, was made into a show, with an illustrated catalog, by the Minnesota Historical Society, in 1987. After several years of exhibit and travel, the objects and documentary originals were presented to the Hidatsa tribe in North Dakota, for their own museum and study.